I wrote a post a little over a year ago about Adam’s feeding therapy, what we did there, and how they tried to help him. 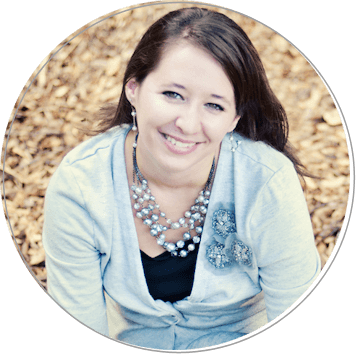 Today, I thought I would write a post about tips for other moms and dads who may be struggling with children who also have feeding disorders. 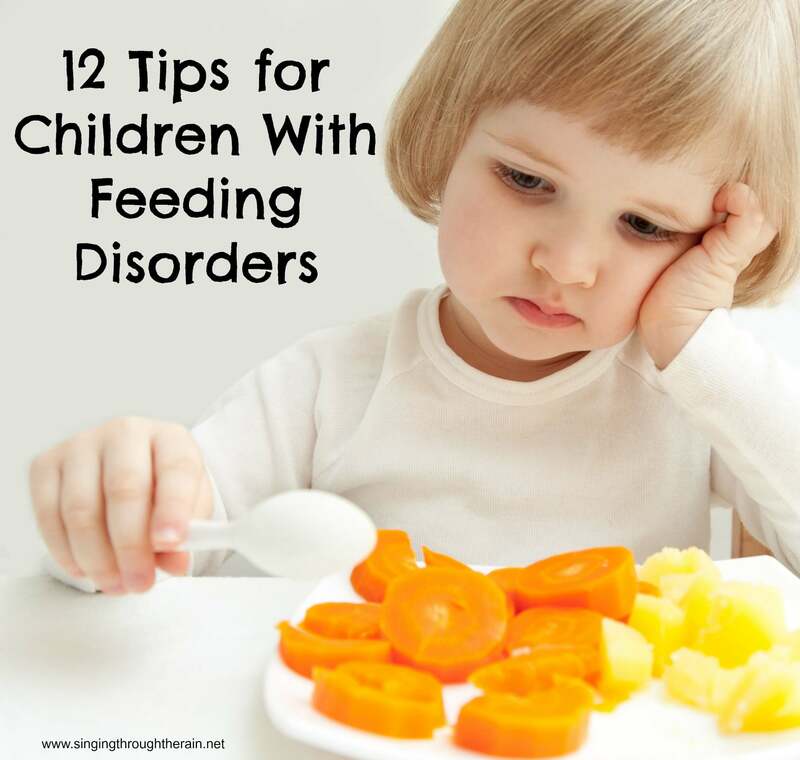 Not sure if your child has a feeding disorder or is just a picky eater? See this article here for help: Eating 101: Picky Eater vs Feeding Disorder. And that is exactly what we do at home and at therapy. We gently guide Adam to touch, play, and interact with his food. We have learned that forcing a child to eat can make things worse and make him refuse to eat even more. Adam has times where he is not hungry and does not eat at all and so we have to take from his signs and let him work up to eating at his own pace. We use a “Steps to Eating” chart from our therapist for Adam for every meal, snack and feeding therapy session. We figure out where Adam is with a particular food – whether he is willing to touch it, lick it, eat it or maybe all he can do is tolerate it on the table, but not on his plate. Then we find that on the chart and try to work him up. He may not get all the way to the top- in fact, he isn’t at the top with most foods, but we have been able to get him to try many new foods through this method and I have seen a lot of improvements! 1. Start with a sectioned plate. Many children who have feeding disorders also have a problem with textures and such. Seeing different foods touching can cause them to go into overload so using a sectioned plate with at least 3-4 sections helps keep food separate and your child calmer. 2. Depending on your child you may have to start with one food at a time instead of multiple foods. Even if you are using a sectioned plate, you may have to start off with one food at a time. Sometimes too many foods can be overwhelming to the child and working and focusing on one at a time is easier. 3. Work your way up the “Steps to Eating” chart with each food and at each meal. For each and every food we have to help Adam work his way through those steps so that hopefully and eventually he might try the food or even eat it. So for example, if he has bananas on his plate we would start with smell. I would say, “Adam let’s smell our banana.” and I would demonstrate it first by smelling it and saying, “Mmmm!” Then I would hold it out to Adam to smell. Next, I would put the banana on the plate and ask Adam to touch the banana. I would also demonstrate by touching a piece of banana and showing him how to do it. If he is willing to touch it for a few minutes, next I would ask him if he could give the banana a kiss. Remember: your child will most likely not work his way up the entire ladder in one meal. It will take multiple meals and multiple times seeing that food. 5. Watch for signs of intolerance. While you are working up the ladder and working on foods, make sure you watch for any signs of intolerance to foods and be patient with it. If your child is crying, gagging, etc at the sight of bananas then they are intolerant of even seeing them and you will have to work up to having them in your child’s sight. If they are touching a food, but are not able to go to the next step, don’t push it. It may be as far as they can go that day and going to the next step may be too much for them and may push them over the edge into a meltdown. 7. Use a lot of praise. I have noticed that in order for this method to be successful it really takes a lot of praise of the child. At every step praising him for doing what he is doing, telling him he’s doing a good job, and making a big deal of even the slightest improvement. A lot of kids thrive on praise and like to know they are doing a good job. We always clap for Adam when he does a good job and he likes the attention and knows we are happy with him when we do. 8. Make it fun. Believe it or not, mealtime can be fun! I know it’s hard to imagine when your child has major feeding difficulties, but making it fun will make the feeding experience one that the child looks forward to. 9. Lots of food play. Food play is just getting in with the food and getting messy! No eating is really involved just using food to play around and touch and feel. This gets your child used to seeing the food, but he does not have to feel pressured to eat it. It also gets him used to the textures before he ever tries to eat it. For example, you might use yogurt as paint, or you may make a train out of strawberries that will go up and down your child’s arms. Be creative and again watch for signs of intolerance and back off a little if they are there. 10. During family meals. During family meals we have been advised to put a small amount of what we are eating on Adam’s plate. So if we are having chicken and potatoes then Adam would get a very small piece of chicken and a dollop of potatoes. He would also have something we know he will eat on his plate like yogurt and cheerios, and we would have yogurt and cheerios on our plates. The goal is to make everyone’s plates the same and show him what you are eating. Even if he does not eat the chicken and potatoes he may be able to tolerate them on his plate and that is a huge step. 11. Use of a timer. Have a child who is not willing to sit at the table for any length of time? Use a timer and work your way up. The goal would be to get your child to sit there for 2 minutes, then 5, then 10, then the length of a family meal. You can put the timer in view and tell your child that he may not get up until the timer goes off. During that time you work on as much food as you can. If your child is still throwing food on the floor, then pick the food up and put it back on the plate and tell the child to put it in the throw-away bowl. You may demonstrate with a few pieces. If the child keeps throwing it on the floor keep picking it up and putting it on their plate and telling them to put it in their bowl. If it keeps happening then take the child’s hand and gently make him pick up the food and drop it in the bowl. We had major issues with food throwing and this has been one of the biggest helps to us. It will take time to get the food throwing habits to stop, but if you are consistent it will work! 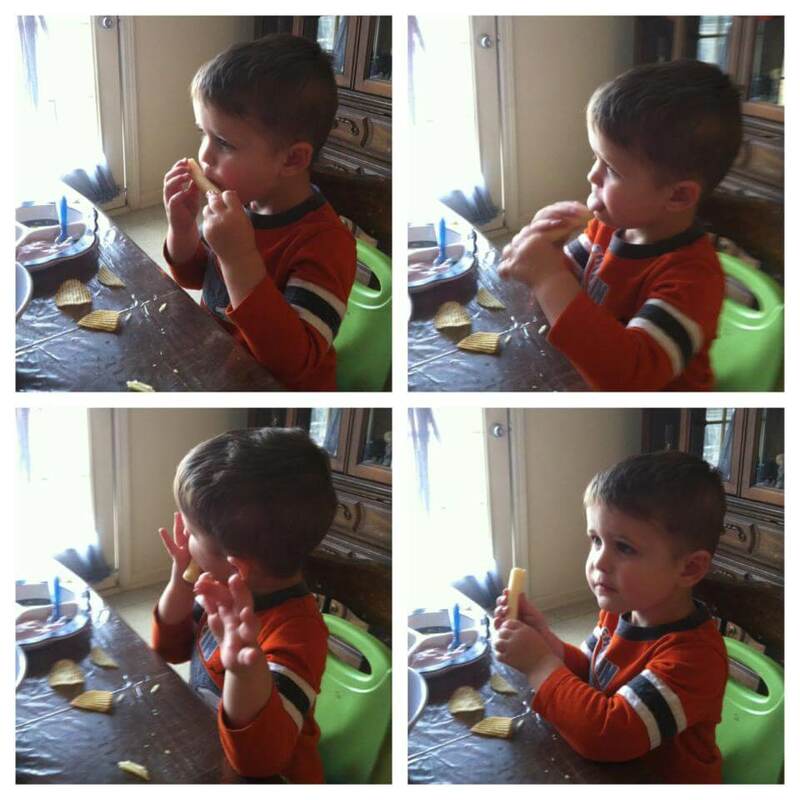 My son kissing, licking and biting a piece of cheese. What do you think? Do you think these may help your child who has a feeding disorder or do you have another method that you use? Please continue to post; this is such a huge help. Even the smallest detail could be the biggest clue!!! You gave me great tips — although it may be a little hard to convince my high school junior to kiss the banana!! My son Teagan is in feeding therapy as well. It is a slow process but it does work! As we have worked up to tolerating a food (but not liking it) we instituted no thank you bites. For example Teagan tolerates chocolate pudding but does not enjoy it so when I serve it I tell him if he chooses not to eat it to give me 3 no thank you bites then he can be done with it. This helps as his likes are few and tolerated foods even fewer! You have no idea how much reading this post made me feel like I am not alone. I try to explain my son’s eating habits to people and they constantly brush it off as a ‘picky eater’. He has eating issues as well as texture issues. We just found out that our insurance will not cover any therapy for him, so I am trying to find things I can do at home. Thank you so much for posting this. I have it printed so I can read it and have it handy at mealtimes. My son is 6 now and you are right our system has changed many times over the years and with his age. At the time of the writing of the original post he was only 3. My first question would be, can your son see a feeding therapist/ If so, I would highly recommend that. Some things we do now: we do the separated plates. He is allowed to pick one food and we pick two to put on his plate. Giving him a choice makes him feel apart of the process. You can also ask let him help you make the food. Currently, we use a timer. He has 30 minutes to eat what’s on his plate. We start with smaller portions of course to get him to eat. He is told at the beginning of the meal what he is working for. So it may be a toy, a piece of candy, a food he really wants, or something else. Having a reward, will help with give him motivation to eat. Praise is still a huge thing for us, but it has changed the older he has gotten. So things like: “Thank you for trying that banana.” “I really like the way you are chewing those crackers.” “You’re doing a great job eating.” During the meal, remind him what he’s working for. “Keep taking bites so you can get that ____.” How that helps a little. Sounds like I need to do an updated post!